AXIS MOON DESIGN AND PRODUCTION solving PATTERNMAKING SERVICES production and contracting needs. production runs. Also, design, consulting and sourcing. 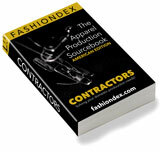 Compare AXIS MOON DESIGN AND PRODUCTION with all 50 listings in PATTERNMAKING SERVICES.